Truth has 3 new hairstyles! If you don’t already know, Truth released some roots & hair base last week, for all hair colors. I’m a fan of roots if the style & color goes well together, but hair bases are just not for me!!! I’ve tried them a lil’ bit in the past (bun hairstyles) but I think my head shape is too odd to wear it with a hair attachment and also, most of them don’t have a natural shape (to complement the hairstyle). I’ve seen people wear this hairstyle with hair base, but to me, it looks fine (if not better) without. A few days ago, I wore a LeLutka hair base with one of the older bun attachments, and I noticed how much nicer it is than most hair bases out there. I’ve noticed that skin designers actually have more realistic looking hair bases than hair designers. I wish LeLutka had kept the hair base style that was released with the skins, cos it’s a lot more natural than the ones released for hair. Do you wear hair base often? Who has your favorite hair base tattoo & does the color match perfectly with your favorite hair color? I wear hair bases on often. I’ve found that my favorites are from Laqroki & they’re pretty versatile. They fit really well with several hair brands that I wear. I usually wear their red hair/brow base or the brown hair/brow base. I agree with you. I liked the Lelutka’s hair bases that came with the skins alot better. I also like Dutch Touch’s hair bases. I wear analog dog’s bases – the hair feathering on them is top notch. If you guys can, please post a link to the hair base(s) you like. I’m actually looking for great ones, as well. I have to say, I was pretty disappointed with Truth’s hairbases. I had wished for Truth hairbases for a long time, and when he finally release them, they are not nearly as good as his hairs. It actually looks weird to me when wearing one of his hairbases with the hairs. I use Analog Dog and Amacci … but how do you get the ones from Laqroki … Dutch Touch … and the others? It would be nice to compare. Agree, Analog Dog hairline gave gentle oval face, and “fits” most of hair colours brand, its modif for colour blended. I never wear hairbases. I look ridiculous in all of them and I think my hair looks worse with them. I’ve never seen one used in a way that I liked. I’ve also had good experiences with Ali & Ali Victoria bangs. I use them to cover front hairlines that are not feathered in well. You know, that ‘straight line’ look. The bangs help defeat it. Wow Camryn, I use bases all the time. They fill in any blank rezz spots. I’ve had good luck, and would be lost without them. I’ve only recently started wearing hair bases Truth being my first ever and i’ve only worn the hair base with Kendall and i liked it with the hair base on it suited my head shape. You may be right about head shapes and angles because when i wore the hair base from truth with Kendall it looked nothing like yours did lol but then again i wear a darker colour hair than you so maybe that has something to do with how they look together? probably! People either love ’em, or hate ’em. My head shape is kind of square on top and i haaaaate the look. I personally use the Laqroki hair bases. They do match my skin tone because I also have been addicted to the Laq skins since 2008, so naturally I have the matching skin to the hairbase. How did you get them? They don’t come with the hair. They do come with the skins, BUT they also come independently as well. In the Laq Body shop (the area you buy the skins) theres a wall with shapes, hairbases, eyes, etc. If you own a Laq skin already and aren’t happy with the included hairbase directly on the skin, I’d suggest getting these because they aren’t just hairbases, they have eyebrow options as well, made to blend seamlessly with the Laq Glow skins. 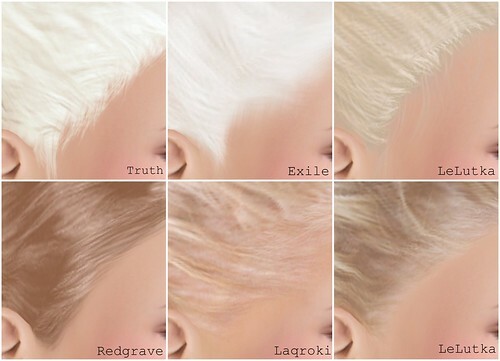 I rarely wear hair bases since I use white, silver, or grey hair and only one hair maker that I know of (Exile) has hair bases that match ALL of the hair he makes. Skin designers unfortunately neglect those of us who wear silver/grey hair. We look ridiculous with blonde, brown, black, and red bases. I have asked some skin designers to include white and/or grey hair bases but have yet to see any. Any and all suggestions are welcome. I wear very few hair makers because I’m picky about my silvers, but would love to try on more hair bases. I’ve been using W&Y and Amacci ones, and I wear hairbases all the time; I would often get blank rez spots, and with my hair being blue the blank spots seemed really noticeable (also, being bluehaired, I’m never going to get the right hairbase coming with a skin). I hadn’t realised Analog Dog doing was doing them too – must grab! Bewteen them, they cover quite a good range of blues, so I wear them with other people’s hair as well. Analog Dog for me too! I find myself unable to give up on laq, for the hairbase being one of the reasons. I find theirs just the perfection of what a hairbase should be. Any others I tried either dont really look like hair at all, aren’t designed to fit most hairbase styles, or have some shape flaws, like the forehead is too low, it’s all straight and circular with a zero heart-shaped value a real hairline would have at least in some degree. I find these truth bases guilty of all of those. As nice as having a base perfectly fitting truth hairs, I’ll prefer one that isn’t as fit in color but makes for a beautiful forehead. And I don’t find the idea of truth hairbase very good either. What is the point of a hair tatoo that doesn’t much look like hair? As perfect truth styles and colors are, their texture is far from good. All blended and stripy with with no shine and some random paler spots instead. I wish they upgrade one day. No hairbase tops laq’s for me yet, but them having just 4 colors is shameful. Why release a zillion skins but be too lazy to color your tatoo? I’m surprised nobody has mentioned the ones from BooN yet. They have a ton of hairbase styles and their hairbases actually give you the option of having the hair gathered high or low, etc. I love them.